Last summer, Colorado was aghast at the way U.S. Rep. Jared Polis, who was upset about fracking near his vacation home, unilaterally threw down cash to hold Colorado’s economy hostage through a threatened ballot initiative to ban fracking. Back then, we called him an overgrown child. 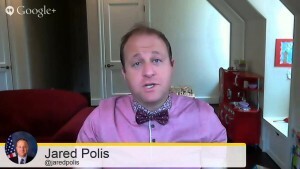 Polis is back to his childish antics in the U.S. House of Representatives. U.S. Rep. Steve King (R-IA), one of the more conservative Members of Congress, introduced legislation that would send decisions about gay marriage back down to the states, instead of through the court system. Polis disagreed with this. So, naturally, he built a coalition to oppose the legislation and worked to whip the votes against this legislation, right? No. That would be the rational and mature approach. Instead, Polis simply introduced legislation that would prevent Steve King from legislating. The bill is predictably titled the “Restrain Steve King from Legislating Act”. Members of Congress disagree on issues all the time, but there are processes in place in the U.S. House to amicably work through these disagreements. Later reports of this action called it a mock bill and claimed he was just a jokester, but make no mistake, Polis has filed this bill. Not only is Polis’ grand scheme entirely immature, but completely unconstitutional. Polis may think he’s being clever, but it’s creepy when a Member of Congress attempts to silence someone with whom he disagrees, no matter if you agree with the issue or not. If this was the first time Polis acted like a spoiled brat over a personal issue making its way through the legislative or ballot process, Colorado might shrug and say, “we’ve all done something unfortunate in anger or frustration”. But, these tirades that involve using his position of power to overwhelm a process are becoming more and more frequent. Each time he throws a fit and nobody reprimands him, he becomes bolder and more entitled. Please somebody (we’re looking at you Rep. Nancy Pelosi) put this overgrown child in time-out.